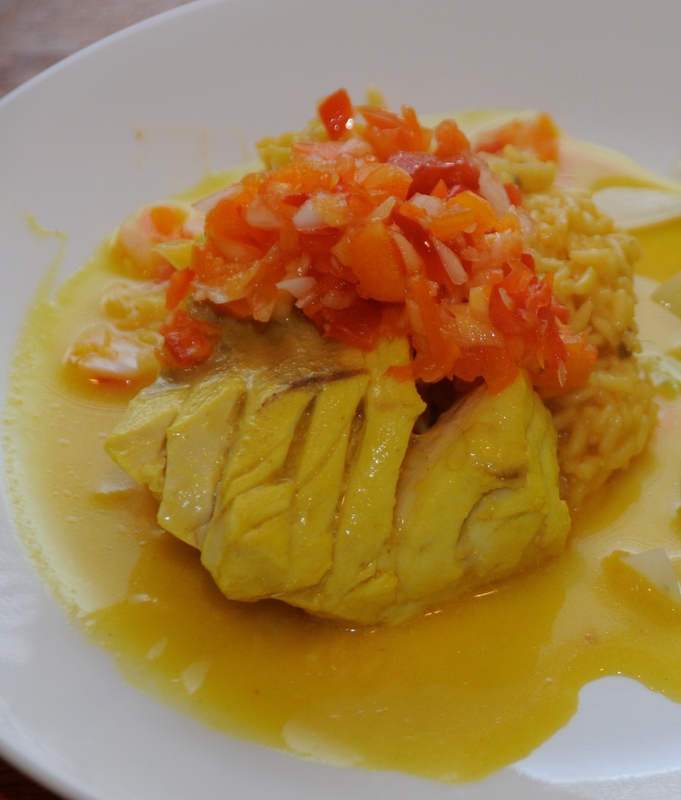 Over the past month or so, we have really fallen in love with Jamaican food here at the MHK. The dishes are so simple yet packed with fantastic flavors. Today’s recipe comes from the back of our jar of Blue Mountain Jamaican Curry Powder; it’s fresh, vibrant, and delicious. The potent flavors of the garlic, onion and curry powder are balanced nicely by the sweet and acidic tomatoes, all soaked up by the fish. 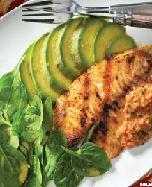 Use a “meatier” fish as opposed to a flaky one – red snapper, catfish, or cod (which we used) would work great. Just be sure not to overcook it! The butter added just before serving gives the dish some lovely richness. Serve it over rice and you’re in the islands, mon. Enjoy! Heat oil in large skillet. Sautee tomatoes, onions, garlic and curry. Add water slowly, bringing to a boil. Add seafood, cover and reduce heat. Cook slowly until tender – fish should flake apart easily with a fork when done. Add butter just prior to completion. Eat! Shrimp, when cooked correctly, is plump, succulent, and delicious. But it’s very easy to cook shrimp incorrectly – there’s only a small window where the shellfish is ready to eat. Undercooked shrimp is very unappealing, and overcooked is hard and inedible. Luckily you can take the guesswork out of cooking shrimp yourself and buy frozen, pre-cooked shrimp. It’s a timesaver and you won’t have to worry about ruining a beautiful shellfish specimen. This recipe uses frozen shrimp in a fantastic fashion, adding protein to a fresh, summertime salad. Watermelon as a salad ingredient is becoming less exotic these days, but it’s still a great way to add sweetness to a dish. The cucumbers and chopped pistachios add texture, and the Feta lends some saltiness to the salad, tied together with a light and tangy dressing. Enjoy! Make the dressing: Put all the zest, lemon juice, garlic, chives, sugar, salt and pepper in a food processor or a small bowl. Process (or whisk) until mixed. With the machine running or while whisking, slowly pour in the oil. 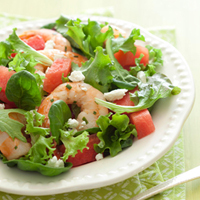 In large bowl, toss mixed greens, cucumbers, diced watermelon, and dressing until evenly coated. In 12-inch nonstick skillet, heat 1 tablespoon of the dressing on medium 1 minute. Add shrimp, stir, and cook about 30 seconds until warmed. To serve, divide salad among 4 serving plates and top with shrimp, Feta, and pistachios. Eat! The MHK received a few concerned emails from our readers following Tuesday’s recipe. Apparently that dish did not seem to be in keeping with our general philosophy of cooking healthy meals at home. In fairness, yes, that’s far from being among the healthier recipes that we have posted here. But it’s also not all that unhealthy; perhaps I should have phrased it that way. That being said, today’s recipe (which also comes from the same Food Network Magazine) should cause no raised eyebrows whatsoever. This is very healthy, very easy to make, and very delicious. While the flavors are Indian in nature, there’s no curry or heavy spice involved. The fish simply absorbs the marinade and sauce, allowing the beautiful garlic, ginger, and lime flavors to come through, bound together with the yogurt and a hint of cayenne and cilantro. The original recipe called for tilapia, but any flaky whitefish will work well here (we used haddock). Pairing the rice with the sauced fish creates a tasty experience with each bite. Enjoy! Cook the rice. Remove from the heat and add the peas; cover and set aside. Puree ½ cup yogurt, the garlic, ginger, lime juice, cumin, cayenne and ¾ teaspoon salt in a food processor. Transfer all but 3 tablespoons of the mixture to a large bowl. 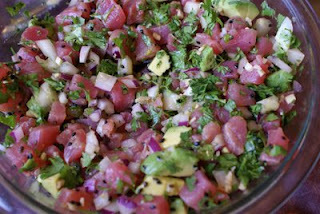 Pierce the fish a few times with a fork and season with salt; add to the bowl and toss. Marinate 15 minutes. Preheat the broiler. Place the fish on a broiler pan (keep as much of the marinade on it as possible). Top with the butter. Broil until opaque, 6 to 8 minutes. Mix the remaining ¼ cup yogurt, the cilantro, and salt to taste with the 3 tbsp. of the yogurt mixture. 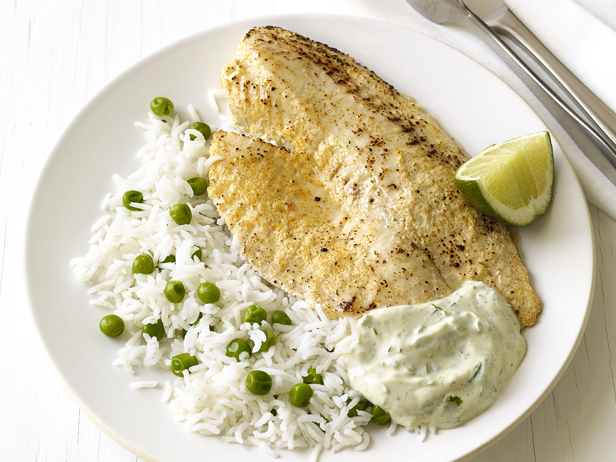 Serve the fish and rice with the yogurt sauce. Eat! We’re down to the wire this week, but we just squeaked this recipe in. All that talk about sandwiches yesterday made me hungry for one. So I turned this recipe, courtesy of the Hannaford Supermarket magazine, into a sandwich. It calls for sofrito, which is basically a salsa of sorts. The ingredients are usually coarsely pureed, and are often cooked together instead of being raw (though not in this recipe). Sofrito is very common in Spanish and Latin American cooking, and in this dish, it’s a great match with the mild fish. Plus the leftover sofrito is great for dipping tortilla chips! Tilapia is called for here, but you can just as easily use haddock, flounder, or any flaky white fish. If you aren’t comfortable grilling fish (it can fall apart if you don’t have the right equipment), you can cook it in a frying pan. The real kicker to this dish is the sliced avocado on top – it gives a great buttery finish to the sandwich. Make sure you use thick bread or rolls so they can absorb the juice from the fish and sofrito without falling apart. Enjoy this week’s Recipe of the Week! Preheat grill or pan to medium-high. While grill heats, prepare sofrito. Put onion, bell pepper, tomato, and garlic in bowl of a food processor or blender; pulse until diced. Add olive oil, and pulse for 5 to 10 seconds, until ingredients become a chunky puree. Add salt and cilantro and pulse until blended. Transfer sofrito to a medium serving bowl and set aside. Brush fillets with olive oil and grill or pan-fry for 3 minutes on each side over direct heat or until slightly charred and just opaque in the center. Sprinkle with black pepper. Place fillet on bottom half of roll. Top with 3 tbsp. sofrito and a few avocado slices. Close with top half of roll. Eat! On Sunday, Spain and the Netherlands will battle for the title of Greatest Country in the World, at least as far as soccer goes, and if each country’s national dish is any indication of who will win, it looks like Spain by a country mile. 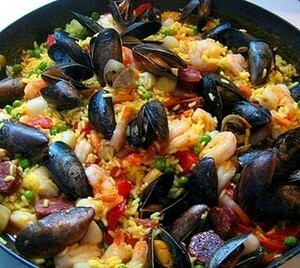 Spain’s national dish is paella, which can be prepared in many variations, but is essentially chicken, sausage, seafood and vegetables cooked with saffron rice and chicken broth. The authentic preparation is done in a special paella pan which allows the rice to get crispy but still be tender. I’ve had versions that had only seafood, ones that had only chicken or sausage, etc. But however it’s made, it’s a bright and colorful dish with differing textures and flavors, and always satisfies. And now let’s take a look at Holland’s national dish, the broodje haring, which translates to “raw herring sandwich.” Yup. Now I don’t want to be too judgmental – I have not experienced broodje haring myself, and I would not want to cast dispersions on it without trying it. 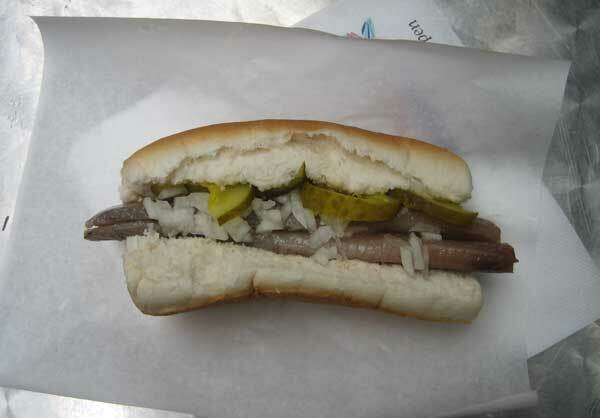 From simplysandwiches.com: “It’s served filleted with some chopped onions, boring pickles and a little mayonnaise in a soft hot-dog bun. It’s cold and a bit mushy, but has a refreshing freshness and bite from the onions and pickles that it’s a pleasure to eat.” But just looking at it, especially compared to paella, makes me think that Spain will win the game 12-0. In a previous post I mentioned I would be attending an event featuring regionally renowned chef Dale Miller. Last night that event took place, and it was a terrific experience. Chef Miller briefly discussed his approach to cooking – luxurious and extravagant food, prepared with the utmost simplicity. These concepts might seem mutually exclusive, but as Chef Miller explained, you can make simple food taste luxurious by using the proper techniques to bring out food’s natural flavor, and by keeping the cooking process as short as possible. He said that if he comes across a recipe that has more than 10 ingredients or takes more than 10 steps to prepare it, he skips it and moves on. I bought into his philosophy immediately. Chef Miller shared some personal stories as well – he is a warm and funny guy…oh, and he can cook! Last night he prepared for us miso-glazed salmon. Miso, as he explained for those who didn’t know, is fermented soybean paste used extensively in Japanese cooking. There are several varieties of miso – he used the white kind for this recipe. It can be found in the U.S. at any Asian supermarket (see this post for a good one in Albany). He prepared the glaze first, then coated the salmon filets with it and seared them in a pan before finishing them in an oven. I am not a fan of salmon – it has a unique taste that I just can’t enjoy, no matter what kind of sauce is on it. But Chef Miller’s salmon was delicious! It had so little of that salmon taste – it was more like a very mild, meaty white fish. And the glaze was superb – sweet and a little tangy. After the demonstration, I talked with Chef Miller about the salmon, and I asked him why it tasted so little like salmon. He agreed that his salmon does not have that real fishy salmon taste – he said it all has to do with how the salmon are raised, and where they are caught. He said farm-raised salmon tend to have that strong salmon taste, whereas a lot of wild salmon does not. He also said that he gets his salmon from either the Pacific Northwest region, or around Nova Scotia. Those areas tend to have the best quality salmon, and he flies it in fresh every day, which is another key to losing that salmon-y taste. Frozen salmon, he said, retains that fishy taste. Obviously you’re going to pay a lot more for fresh salmon every day, but for him it’s worth it. So here is the recipe from last night – and to my own surprise, a salmon dish is this week’s Recipe of the Week! The sake and mirin are both different kinds of Japanese rice wine – you can also find these at any Asian market. You can make this dish in the oven/broiler, on the grill, or on the stovetop, which is the method I will describe here. Enjoy! Make the miso at least 2 days prior to use. In a saucepan, bring the sake and mirin to a boil and boil 2-3 minutes to let the alcohol evaporate. Reduce heat to medium. Using a wooden spoon, stir in the sugar until it dissolves. Slowly mix in the miso paste, a little at a time. Cook 10-15 minutes, stirring constantly so the mixture doesn’t burn. Strain miso mixture to remove lumps, then let cool and refrigerate. When cold, pour a good splash over each salmon filet. 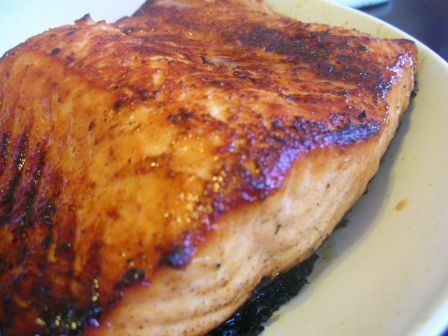 Let salmon marinate for 1-2 days. Heat a sauté pan on medium-high heat and add a small amount of vegetable oil. Place filets in pan and caramelize both sides. Reduce heat to low, add a small amount of white wine or sake and a small amount of miso. Cover and cook until done, about 5-7 minutes (it should flake apart easily). Transfer to plate, drizzle a little miso glaze over the top. Eat!